This is a simple theory. 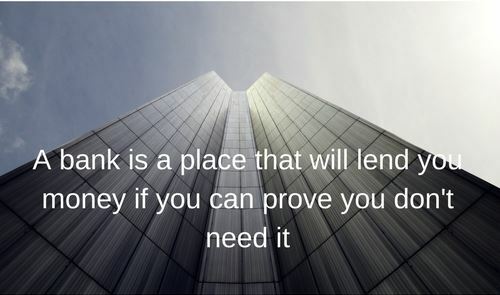 Any sensible lender would logically lend only to a business if the lender is confident and assured that the borrower have the means to make repayment. Your chances of securing an approval for your business loan application is higher when your company is it its best financial position. Not when it’s at its worst shape. You also tend to enjoy better terms from the banks, like lower business loan interest rates or lower facility fees if your credit profile is strong. Just like how most people would only quit their job where they have found one, and only sell their existing house when they have purchased their new house, it is best to plan ahead when seeking a business loan in Singapore. If you ever find your business in the below 6 situations, it would be prudent to initiate financing applications ASAP. As a small business owner, you would most likely be able to sense an impending downturn or slowdown in your industry or the general economy before the media starts reporting about it. Some banks might deem a particular industry that is experiencing a downturn negatively and classify it under high risk industry financing. This will affect the credit supply and interest rates of all SMEs in that industry. If you anticipate an economic recession brewing, do apply for a business loan for working capital cushion before it’s too late. Because in a recession, most banks will cut lending to SMEs or even stop lending to the entire small business sector. Credit will be very hard to come by with the banks’ credit tightening. SME lending is generally deemed as a high risk segment for most banks and they have traditionally slowed down lending to small businesses in a recession. Once you anticipate a recession or slowdown, do prepare to apply for a business loan in advance. If you’ve hit the boom time and experiencing a sharp exponential growth in your business, this is also a good time to apply for a loan. Most would think that only businesses that are struggling need to apply for a loan. Why would a booming business require a loan? High growth brings along its own set of financial problems as well if you are a SME and not well capitalized. Internalize first whether if your SME is ready for expansion. You might have snagged that big deal with a multi-national corporate which will propel your business into the stratosphere. If your customer needs you to support their operation across the region or even globally, it’s a great opportunity to tag along and grow beyond our shores. However, do you have the capital to finance this expansion? You’ll need more working capital to finance your rapid expansion including buying more inventory, purchasing equipment, conducting mass hiring and moving to a bigger location. Anticipate cash flow for your expansion needs well in advance so you can plan ahead on your financing. In certain situations, you might find that the cost of essential supplies or raw material for your business rises sharply or higher than usual. Due to external economic, freak weather or political factors which are not within your control, costs may escalate on some supplies. For example, sand costs might go up due to neighbouring country’s reluctance to supply us with sand. This will affect construction companies. Soft commodity prices like sugar and rice are also affected by exporting country’s weather condition. An increase in food commodity prices will affect F&B industries the most. When you are anticipating a spike in raw material costs, take pre-emptive steps to react. If you’re in a fiercely competitive industry where consumers are price sensitive, your competitors likely will absorb the price increase initially. Without holding power, if you pass on the cost increase to your customers, your revenue and market share might take a beating. Before you devise a new strategy to meet this challenge, (either by diversifying supplier source and pivoting to other related business), you should start sourcing financing to buy yourself some time before planning your next move. You can also explore revolving SME loan credit banking facilities such as trade financing which allows you credit terms when financing your suppliers’ payments. Over the course of your business, you might identify certain risks or spot opportunities to improve the company. All businesses undergo some form of changes and pivot in direction over the long term as nothing stays static. You might want to factor in your financing plans in your change strategy as well so you are well prepared and capitalized. If you find yourself constantly having to chase your customers for payments to meet your monthly payroll and bills, you are most probably experiencing a cash flow issue. If you’re customers are demanding much longer credit terms compared to the shorter credit terms your suppliers are offering you, apply for trade financing or overdraft facilities to smooth out cash flow. Compared to the other situations listed here, this is the most adverse situation you can find yourself in. If your cash flow is deteriorating, you must seek financing before it gets too late. Once your financials and bank statements display signs of heavy distress, most banks would probably not be able to finance your company. If you’re in a seasonal business such as retailing of winter wear or selling Chinese New Year food stuff, you also like to plan financing appropriately. Try to apply for revolving credit facilities such as bank overdraft during peak periods (and when your cash flow is at its strongest on paper) to help cope with the corresponding increase in purchases and business expenses. Apply for term loan during the tail end of your business’s peak to ease out cash flow during the subsequent lull periods. Always anticipate and plan ahead for business financing. You’ll find that we use this recurring theme multiple times in our articles. The reason is because we cannot emphasize on this enough. In the course of our work, we find that the number one reason why business loans are rejected is due to poor planning. Many SMEs apply for financing when it’s too late and as a result, they are faced with bank rejections or have to accept higher interest rates from alternative funders. By keeping an eye on your company’s cash flow and always planning a step ahead, you’ll ensure your business is always in optimal position when it comes to financing. Pingback: Should You Accept the Business Loan Top Up Offer?